ShareMouse 3, a program to control multiple computer systems with a single mouse, has been updated recently to version 3. The new version introduces support for Windows 10 and Apple OSX El Capitan, improved network code and more. If you work on two computer systems side by side, and it does not matter if its a desktop system and laptop, a tablet, or even a system running another operating system, then you have to use different input types connected to those devices. For instance, you cannot just use the keyboard connected to one PC on another, or the mouse to control elements on the second computer's monitor. ShareMouse has been designed to make that happen, at least when it comes to the mouse. The only requirement is that you run the software on the devices you want to control with a single mouse and that is about it. It is not the only program that offers the functionality. There is Microsoft's Mouse without Borders and Stardock's Multiplicity which offer similar functionality. We have reviewed ShareMouse twice before here on Ghacks, first back in 2012 and then when version 2 was released in 2013. ShareMouse is offered as a free and commercial version that work fundamentally the same. The program works out of the box once you run it and does not require configuration. While that is the case, you may still want to check the preferences to modify them to better fit your requirements. For instance, you may want to enable a key modifier to avoid accidentally moving the mouse to the other monitor. As far as changes in version 3.0 of ShareMouse are concerned, there are several that deserve closer inspection. One great new feature is the ability to take different monitor dimensions into account automatically. 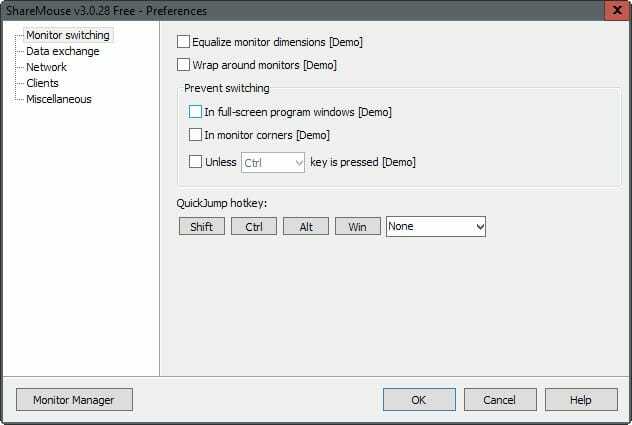 This means that different sized monitors can no longer cause issues when using the program to switch between them. The improved net code improves the network performance of the program. It uses AES encryption now automatically, data transfers are more reliable and faster, and lag has been reduced when the program is used to switch between monitors. Commercial users benefit from an infinite loop concept that connects the left side of the first monitor with the right side of the last monitor in the chain to quickly switch between those two monitors. Last but not least, there is now an option to configure ShareMouse in networks with blocked UDP ports. ShareMouse is an excellent program for Windows and Mac systems to share a mouse on multiple devices. The new features improve the program even more and make things easier for users who work with different sized monitors. Thanks Martin, For this ferry well written informative article. To bad they still do not include Linux in the mix. Maybe/Hopefully it will come soon.